If Yamaha quickly established its reputation in the 250cc class with its YDl, introduced in 1957, the marque was off the mark in the 125 category, in which it had made its debut in 1954. The very Germanic lines of the first YA1 had been modernized in 1958 with the YA2, which had a new and original style. The YA3 followed, largely unchanged, in 1959, but, like its predecessors, kept the DKW inspired single, which was well past its best. The revolution started in 1961 with the YA5 (there was no #4, an unlucky number in Japan). Yamaha had just absorbed a number of small marques. One of them, Showa, very technically-advanced in both two- and fourstroke design, had just developed a rotary valve engine inspired by the MZ in Germany. Yamaha successfully used this layout on its 125 RA41 and 250 RA48 racing bikes in 1961, and applied it to a production machine. Original but Short-LivedIn dire straits in 1961, Yamaha attempted to diversify into outboard motors and plastic boat hulls. The firm, which had just experienced a costly setback with its SCI scooter in 1960, could not afford to make a false step. The new generation of 125s began with the 1961 YA5, which used a new oversquare engine with a rotary intake valve and a power rating of 10 hp at 6500 rpm. Serious progress was not made until 1963, when the YA-Tl was launched, which reproduced the lines and color schemes of the marque's 250s, and adopted a tubular frame. It was quickly supplanted by the Y A6, with a steeply-inclined engine, eclipsed in its turn by the arrival of the Yamaha twins. 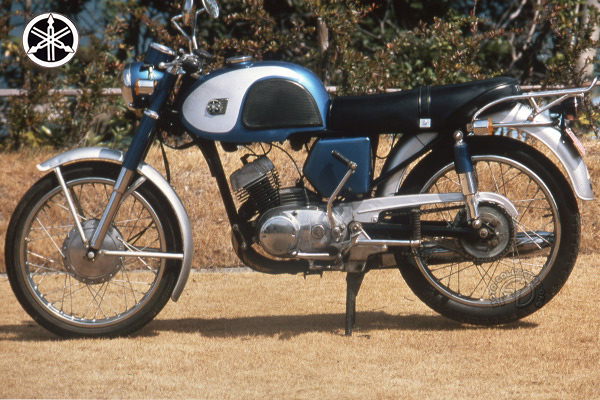 This rare YA-T1 was the first truly modern and original 125 machine to be built by Yamaha.